Management of infections in rheumatic patients receiving biological therapies. 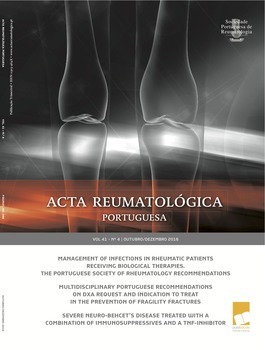 The Portuguese Society of Rheumatology recommendations. The relationship between vitamin D, vertebral deformity and quality of life in psoriatic arthritis. Determinant factors of pain intensity in overweight and obese adults with knee osteoarthritis. Severe neuro-Behcet’s disease treated with a combination of immunosuppressives and a TNF-inhibitor. Central nervous system vasculitis in pediatric microscopic polyangiitis. Infections in an inpatient rheumatology unit: how big is the problem?